Antibiotics again for the last week to clear conjunctivitis and the gunk that has been in Kien's sinuses for infinitum (well that's what it feels like anyway). So the whole household is back to having lack of sleep, and Jef & I are also poorly as well. At one point my head was so stuffed up I felt like it was going to explode as it hurt so much! If that was how I felt then no wonder Kien is having a difficult time. Here's hoping we all get well soon. Yesterday turned out some stunning weather so we went for a walk to Victoria Park. Kien got to play on the swings and we sat and watched some cricket being played...fabulous way to spend a lazy recuperating Saturday afternoon. 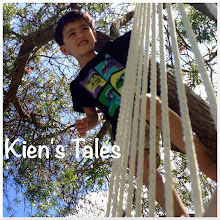 Kien has exhibited an interesting behaviour - he puts things into one place. We scatter toys all around the lounge floor for him to find, and they end up on the table. He gathers them one at a time, crawls over to the table and puts them on top. When he is in the bath he puts his toys in the hole at one end of the tub. And when I am in the kitchen and he is behind the makeshift gate he drops all his toys over the fence. We are teaching him how to clap at the moment and he is slowly getting it. Still no baby signs yet although I have been doing milk, mummy, daddy, eat, all finished and bath to him. I try to sign as much as possible when I remember. I've been waiting for him to do a sign back to me, and then I will ramp up the signing. He is getting the hang of mimicking a few sounds/words we make. Kien's sound for "Hello" is "Uh-oh", and most of the time when we say it to him he will say it back. He also says "mama" if we say "mama", and "dada" and "baba" as well. Also he will mimick a rising squeal if we do it. The other day Kien crawled over and handed me toys, twice. He has handed me things before (more like dropping things in front of me or in my hands if I catch it), but this time it was an obvious handing over of his toys, and Jef witnessed it too. All of this development is so exciting! We were looking everywhere for a rubber duck but couldn't find a classic one in any stores. Then when we had the interview with "Growing Up in NZ" they gave him one as a gift. He loves it too. Bathing him in the kitchen is now a thing of the past...as of tonight. We have migrated to the bathroom, finally. He just splashes around way too much and was getting water all over the kitchen floor. Now he can slap the water to his heart's content. OK, so Kien has now spent more time in the world than inside my womb. I guess I can stop counting his age in weeks now. He has sprouted another tooth already! The tip is showing under his bottom left gum. He has been pretty cranky this last week so good thing something has appeared. What is interesting though is that he is grumpy until I drop him off at daycare, and as soon as we arrive he is sweet and smiley. What is with that? I don't take it personally. I'm glad it's not the opposite reaction though as that would make me feel horrible leaving him. Plunket paid us a visit on Tuesday for the 9 month checkup. Kien has lost some weight due to being sick - he is only 7.1kg. So he has dropped off the world health organisation's third percentile. He is however still a tall little boy - 73.5cm, which places him around the 75th percentile. I've been trying to feed him as much as he can consume. He isn't doing too badly with his solids. I've been cooking up a storm and have a freezer full of pureed food adventures. Lets see how long it will take for him to finish everything.